Every week of this outdoor Mister Sunday season, the party begins with the airing of an entire album. This week Justin Carter, who’s playing solo, selects. He’s chosen The History of Jazz Vol. 3: Then Came Swing. This is what he has to say about it. I’ve chosen this week’s album for couple reasons. 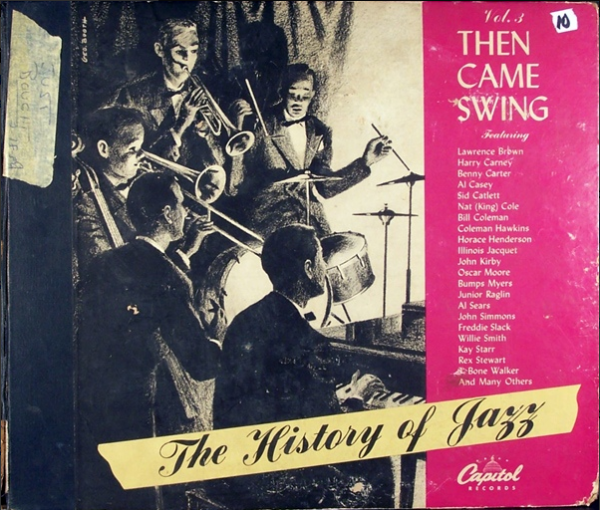 One is that I love old jazz and blues, and this set from 1945 is full of great names like Coleman Hawkins, T-Bone Walker, Benny Carter and Nat Cole. But the other is because of the format and a question that it answers. Before I collected 78s, I always used to wonder, “Why do we call LPs albums?” Well, as I was digging through old collections, I started to find bound books full of records – they looked a lot like photo albums, actually, but inside, the pages would be sleeves holding 78s. Until the vinyl LP was widely introduced in 1948, the dominant technology was a shellac record cut at 78rpm. While the LP could hold twenty minutes of audio on a side, the 78 could only hold five minutes (most just held three-and-a-half), so if you wanted to hear a collection of songs, you’d have to buy a book of records – literally an album. The term stuck, and even though LP (short for long player) was the official term for the format that replaced the book of 78s, “album” stuck. Beyond the trivial reasons for bringing out The History of Jazz, there’s a special bonus: I’ll have my player, so I can bring down some gems from the rest of my 78 collection, which I’ll try to squeeze in through the rest of the day. I’m looking forward to playing them for you on the big system!